Carry us wherever the hell we want them to 😉 Preferable Barefoot! So let’s have a look at these amazing structures. Our feet are the home to 1/4 of all bones in the body. They contain 33 joints! and over 150 ligaments and 20 muscles. This is truly amazing stuff. But think about it. Our feet are our base. Nearly all fascial lines are somewhat directly connected to our feet. We stand or walk on these things a lot ( well, not so much nowadays, but they were designed to cope with that constant amount of stress). And that is exactly why there is so many joints and ligaments and muscles and bones. To be able to move in multiple directions to adjust to all sorts of terrain, and to disperse the amount of force that goes into the feet with each and every step throughout the whole body. Sharing is caring 😉 and going barefoot would be the best way to this. Could it be that a lot of issues we see in knees, hips and even shoulders could originate in the feet due to poor alignment or poor ability to move? 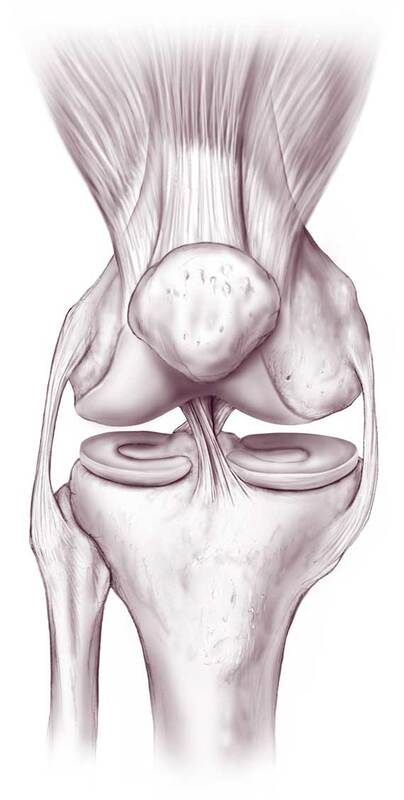 The knee joint as well as most major joints in the body are stacked horizontal. And what happens over time? Cartilage and that inbetween wears away and we see bone on bone scenarios happening. Imagine it was the same in the feet. How quickly would we need new feet to keep walking? Luckily nature is pretty smart and all joints in the foot are orientated vertical to each other so force can be dispersed through gravity, instead of in line with gravity. 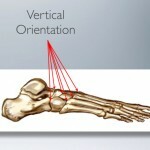 Once we get to the ankle, bones start to stack horizontal. This is important because our joints have a position, as well as move. Simply look at the two following pictures here and imagine how different the joints have to act/move because their position got changed. The foot in the high heel is very restricted. 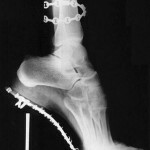 This is why it looks so staccato when woman walk in high heels. Now, you may say this is an extreme comparison, and yes it is. 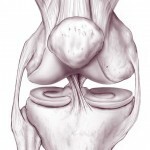 However, even only a slight heel changes the angle of the position of the joints and therefore affects how they move and function. Yes, our bodies are amazing at adapting to all sorts of situations and stressors, but very often it will get you back at some stage in your life. And even more often somewhere else in the body, and that is exactly why it is then so difficult to find out where the issue originates from. Another issue we often see and that causes a lot of problems is when you look at the toe box of most shoes. They are narrow and often bind the toes together. 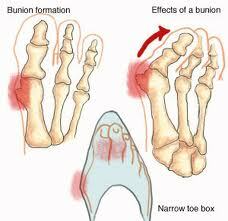 And people wonder why the get hallux valgus (bunions). The big toe has a great responsibility. Most of our body weight gets loaded onto the big toes when walking. 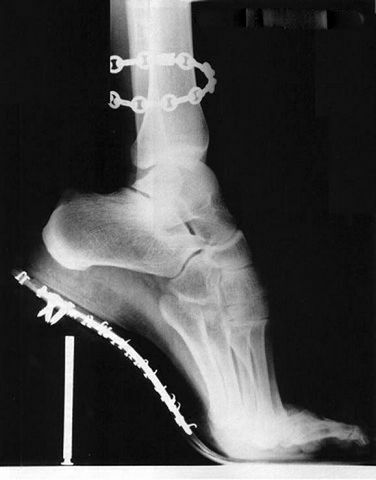 If you wear shoes that bind the big toes towards the other toes, away from where it would naturally move to load that weight and take in that force, the body has to find another way to deal with this. So it uses the next best thing, trying to make it stronger. Your first metatarsal. To summarize this, we want our feet to have room to move to be mobile to deal with the ground reaction force it is faced with at every single step we take. 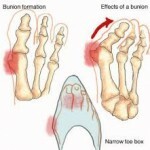 However, we need some stability in our feet as well, otherwise we would not be able to push off the ground effectively. The answer to how this is found in the mid-tarsal and subtalar joints of the feet. These joint complexes will lock for rigidity and unlock for flexibility depending on what the front and the back of the foot is doing. 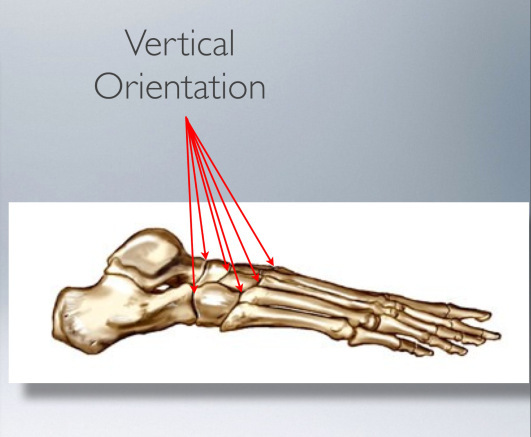 We are looking at inversion (arch comes up), eversion (arch comes down/fla t foot), dorsi (toes up) and plantar (toes down) flexion, and rotation. 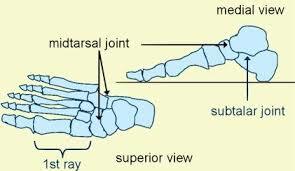 So for example: When inverting the subtalar joint is locked, when everting the subtalar joint is unlocked. When we talk about flexibility and rigidity we are also talking about instability and stability. Stability without mobility is rigidity. Instability without mobility is flexibility. Hence the key to a healthy and functional foot is MOBILITY! Our bodies actually need impact forces. And we need to receive them the way we were supposed to, to disperse them properly through the body. 80% of the plantar receptors are sensitive to vibration. Vibration is how we detect surface which creates the reaction in stability/locomotion. It’s important to keep plantar receptors young as we age as sensitivity threshold increases and density decreases. The more cushioning we wrap around our feet and the more mobility we take away from them, the more we block our receptors and therefore the sensory intake and which leads to poor motor response. Please please please do not take all this and immediately throw all your shoes out to get some barefoot shoes!!! You have to transition slowly!!! Otherwise you will cause more damage than good! Also, you may have things going on that actually do need some support and an even slower transition, with lots of attention and training. You can train your feet back to health, but it is a slow journey. When I went to Europe last year I walked a lot, and a lot on cobble stone. 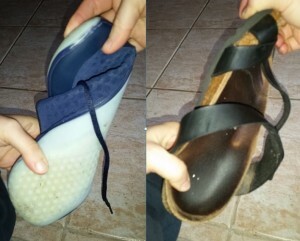 I still have a pair of ‘normal’ shoes with a not as flexible sole. On days when I wore them, my feet hurt at the end of the day. 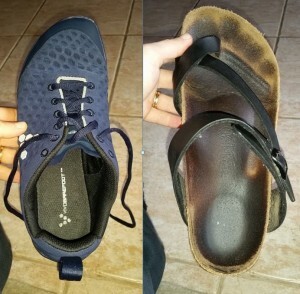 When I wore my barefoot shoes, I was fine! It was almost like my feet welcomed every unevenness in the ground. Took it in to figure out and play with it on how to deal with it most effectively. They also do every day style shoes which is super awesome!!! Should you want/need any info, have questions…I am here to help you with foot strengthening exercises as well as corrective exercises. It has been around 18 months for me now that I have changed into barefoot shoes, and I am not looking back. I believe that setting your feet free, will set you free eventually!